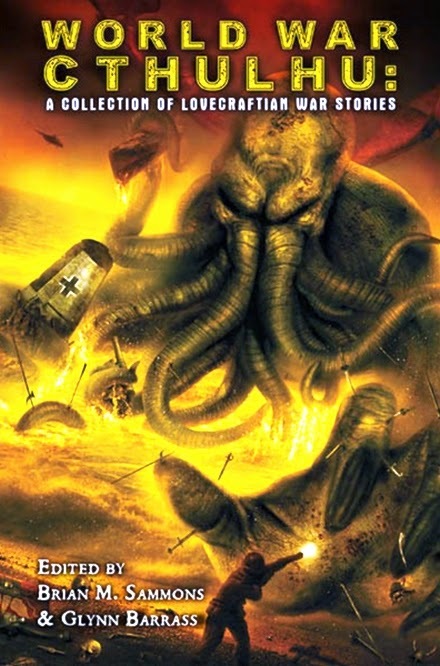 Here is the ever-so-lovely cover image for World War Cthulhu: A Collection of Lovecraftian War Stories, which features my story, "The Game Changers." (Click the image to enlarge it.) The anthology, due from Dark Regions later this year, will be published in ebook, trade paperback and signed limited edition hardcover formats. The publisher is running an Indiegogo campaign to fund a number of unique extras not offered in regular market versions, such as a collector's deluxe signed slipcased hardcover edition, which will be offered only while the campaign is in progress. There are numerous pricing tiers for pre-orders, each offering specific perks for purchasers at that level. For a buck, you get a PDF of the book; for $5, you get the ebook; for $15, you get the trade paperback. But if you contribute $50, you get the signed, special edition hardcover, plus ebook; for $99, you get the signed limited edition hardcover with guaranteed number request, plus a World War Cthulhu digital artwork print signed by artist Wayne Miller, plus two special edition trade paperbacks, plus ebook, plus World War Cthulhu bookmark, plus high-resolution desktop wallpaper, plus PDF art book of all World War Cthulhu artwork, plus your name listed on a special acknowledgement page. Other tiers offer various perks, including having your name used in a special story written by one or more authors from the book. The campaign runs through April 20. My story, "The Game Changers," is set in the jungles of Vietnam, right after the Tet Offensive, but the tales herein cover warfare from virtually every period of history — from the legend of Achilles and Agamemnon to the Crusades to the Revolutionary War to World War II to present-day Afghanistan. Contributors include Neil Baker, David Conyers, Tim Curran, Ed Erdelac, Cody Goodfellow, Ted Grau, C. J. Henderson, David Kernot, William Meikle, Christine Morgan, Edward Morris, Konstantin Paradias, Robert M. Price, W. H. Pugmire, Peter Rawlik, John Shirley, Darryl Schweitzer, and Jeffrey Thomas. Cover art is by Vincent Chong, interior illustrations by M. Wayne Miller. That scary fellow in the photo there is a tired but very satisfied Mr. Rodan after finishing up the restoration of "Darkness Falls" (GC14WGB) this evening (see "Restoring 'Darkness Falls,' February 21). It took several trips and many miles of hiking to get it all done, but I came out of the woods about nine o'clock this evening with the whole thing finally put to bed. It's ready to be hunted again, and I hope my efforts do justice to the original, classic Darth Sketcher hide. The old containers all had seen better days, and a couple of them were beyond repair; at least one container was missing altogether. Night caching is a unique treat. The hides are generally set up where you follow reflectors from one stage to another until you reach the final container. "Darkness Falls" is spread out over five different trails, each involving short- to medium-distance hikes, and there are no reflectors to find until you're very close to the stages themselves. Some of them are fairly straightforward, a couple are rather tricky. To access the contents of the final container, hunters must collect and decipher the information they have gathered from the preceding stages. The chances of actually finding the cache in daylight are slim. I did enjoy tonight's final outing, as I found three other caches as well, one of them ostensibly a canoe/kayak cache, though it was accessible — only just — from the lake shore. That one had gone missing some time ago, and the container had been replaced; however, the container I found, half-buried amid the muck along the lake bank, was the original, which had not been found since August 2010. Ironically, I could not find the newer replacement container. I also brought home the first tick of the season. Since the spiders are all out there in prodigious numbers — their eyes glow beautifully in the darkness when your flashlight beam hits them — I guess it would stand to reason, but since we had the deep freeze to end all deep freezes just over a week ago, I didn't anticipate the little assholes being out there already. Who knew? Anyway, go play in the dark. It's fun. No, not the 2003 movie — which I vaguely remember seeing, though I have little recollection of it — but a night cache called "Darkness Falls" (GC14WGB) here in Greensboro that I have recently adopted, since its creator — the nefarious "Darth Sketcher" — is no longer active. A couple of weeks ago, Todd "Tbbiker" Briggs; Fred "Smashemups" Hudolin; Fred's son, Joe; and I went out and attempted to find this extensive five-stage multi, and we did... sort of. At least a couple of the stages have gone missing since the cache was hidden, back in 2007, and one of them was damaged beyond repair. We made it to the final stage only with the help of a couple of previous finders. Still, since I have a great appreciation for night caches, I decided I would take on the restoration and maintenance of this venerable Darth Sketcher hide. "Darkness Falls" is actually a Star Wars–themed cache, with each stage named after one of the planets featured in the movies: Stage 1 is Tattooine; Stage 2 is Coruscant; Stage 3 is Mustafar; Stage 4 is Hoth; and Stage 5, the final, is Endor. The stages are located on five different trails on Greensboro's north side, and the hides leading up to the final get progressively more difficult. So far, I've replaced two of the five, which have been little adventures in and of themselves. 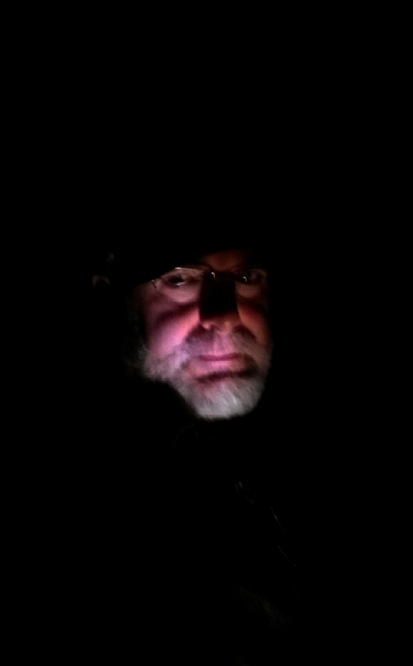 It's invigorating to be out there on a mission, alone, on a chilly evening — to be the the spooky thing prowling the woods, seeking, finding, and, when necessary, replacing reflector tacks on trees. On my way along the trail, I noticed a two pairs of reflectors high up in a tree, which I thought was an odd place for them, since it was off-track for the night cache. Turned out to be a couple of possums, who appeared quite intrigued by my nighttime wanderings. Possums are kind of cute in their ugly way, and they were welcome company out there. Shortly after meeting these little folk, however, something big, and I mean it sounded Godzilla big, went splashing through Lake Townsend, and if that wasn't Bigfoot, then Bigfoot was missing his opportunity to sound menacing and impressive. Never did see the noisemaker, but if it was Bigfoot, I suspect he was out there after one of the caches that's named for him on the nearby trail. I'll have to make couple of more night outings to finish up the restoration, which I hope to get done this coming week. I know there are a few people anxiously awaiting the cache's reactivation, and I certainly don't want to keep them waiting any longer the necessary. Use the Force, why don't you. It's review time! The current weather couldn't be more conducive to watching this venerable 1957 Hammer film, and last night, after a trying afternoon in the snow storm (see yesterday's entry, "The Great White Beast"), an eerie, late-night monster movie — though I use the term loosely — seemed just the ticket. I saw The Abominable Snowman of the Himalayas when I was a youngster, and I recall finding it boring. It was slow, talky, and featured little in the way of monster action. In my more mature years, I consider all of these things among the movie's major strengths. The film begins with botanist John Rollasan (Peter Cushing); his wife, Helen (Maureen Connell); and his assistant, Peter "Foxy" Fox (Richard Wattis) undertaking an expedition to the Himalayas to uncover rare flora. Their base of operations is a remote Buddhist monastery overseen by an affable but rather enigmatic Lama (Arnold Marlé). Another expedition, consisting of adventurer Tom Friend (Forrest Tucker), trapper Ed Shelley (Robert Brown), photographer Andrew McNee (Michael Brill), and Sherpa guide Kusang (Wolfe Morris) arrives at the monastery, this one seeking the legendary Yeti — the Abominable Snowman of the title. Friend persuades Rollasan, over the objections of his wife, to accompany them on the long, dangerous climb into the mountains' upper regions. Rollasan believes the Yeti might indeed exist but is interested only in the creature as a scientific marvel, while Friend seeks to capture one so he might make a personal fortune. On their ascent, the group discovers huge footprints in the snow that convince them the creature is real. Shelley sets out bear traps, but McNee ends up stumbling into one and is injured. That night, something visits their camp, sending Sherpa guide Kusang fleeing down the mountain. Shelley sees the silhouette of their mysterious visitor in the distance and shoots at it. Following the trail of blood, the men now learn that the Yeti is real, for Shelley has succeeded in killing one. Rollasan examines the body and claims it bears some resemblance to a human being, possessing a certain aspect of "wisdom." They wrap the gigantic body so that it can be transported by sledge upon their descent. However, strangely mentally affected, McNee takes off on his own and dies in a fall. Friend, determined to capture one of the creatures alive, has Shelley rig a net inside a cave and wait there with the dead creature's body for a visitation. The ploy succeeds in luring one in, but Shelley dies, apparently of fright. Though their radio is broken, Rollasan hears a broadcast warning his party to leave the mountain. Convinced they cannot proceed farther, Friend agrees to abandon his search for a live creature and return with only the dead body as proof of the Yeti's existence. However, he then hears Shelley's voice calling "Help me!" from somewhere in the distance, and when he goes outside, he is killed by an avalanche. The Yeti themselves finally appear to Rollasan, the last remaining member of the party. In a silent but profound confrontation, Rollasan comes to understand the Yeti are indeed intelligent — and may, in fact, be simply biding their time until the end of humanity, when they will inherit the earth. Helen Rollasan, concerned for the safety of the party, has mounted a rescue expedition, and they find her husband, nearly frozen to death in the snow. Upon their return to the monastery, now understanding the true nature of the Yeti, Rollasan tells the Lama they found nothing. Clearly understanding all, the Lama simply nods and states, "The Yeti do not exist." The Abominable Snowman was directed by Val Guest (known for numerous Hammer films, including The Quatermass Xperiment, Quatermass 2, and When Dinosaurs Ruled the Earth, as well as contributing to 1967's Bond-ish extravaganza, Casino Royale), and written by Nigel Kneale, based on the earlier BBC-TV production, The Creature, which Kneale also wrote. The story is undeniably slow and oftentimes dialogue-heavy (Peter Cushing reputedly improvised many of his lines), but the film builds an eerie atmosphere, based on thoroughly convincing settings and on suggestive rather than graphic depictions of the Yeti themselves. Cuts between location shooting (in the Pyrenees range, one the border between France and Spain) and sound stage (Bray and Pinewood studios in England) are mostly seamless, creating an effective sense of visual continuity. The set for the Rong-Ruk monastery appears dark and claustrophobic, its interior maze-like, its inhabitants — portrayed largely by the staff from several London Chinese restaurants — quite convincing as Buddhist monks. A scene of a ritual ceremony, complete with masks representing the Yeti and foreign, almost alien chanting, agreeably calls to mind the Odo Island natives' ceremony in the original Godzilla, deepening the sense of strangeness that permeates this remote outpost of humanity. Peter Cushing as Dr. John Rollasan exhibits his customary classiness as an actor. Playing a principled intellectual, he makes fine use of his distinctive voice and refined verbal mannerisms. As the sensitive but strong-willed professor, in his few scenes with Helen, he conveys a touching tenderness toward her, despite his character's intent to act against her wishes. Cushing's Rollasan is the necessary counter to Forrest Tucker's Tom Friend, a self-centered, reckless, yet not unlikable exploiter, whose doom is spelled early on by his abandonment of traditional morality. Robert Brown, who would succeed Bernard Lee as 'M' in the 007 movies of the late 1980s, plays the trapper, Shelley, with a shade too much exuberance, displaying the boisterousness and exaggerated physical gestures of a theatrically trained actor. The character McNee, portrayed by Michael Brill, is all but superfluous, offering little character depth or material contribution to the Friend expedition. His main role is to foreshadow the psychic influence of the Yeti prior to their actual onscreen manifestations. Nerdy professor Fox, played with amusing British quirkiness by Richard Wattis, adds little substantive to the film; his sympathetic interactions with Helen Rollasan serve more to highlight her concern for and devotion to her husband. As Helen, Maureen Connell is afforded an opportunity to show a tad more backbone than many supporting female characters from this era of films, particularly those of the horror/science-fiction persuasion. Despite her inability to sway Rollasan from his danger-fraught intentions, she avoids that infuriating, helpless hand-wringing so typical of female characters of the day and takes an active role in bringing her husband back alive. Humphrey Searle's musical score provides a dramatic backdrop for the film, sometimes low-key and atmospheric, other times brassy and powerful, effectively corresponding to the images on the screen. Other soundtrack cues — the keen howling of frigid wind; the disconcerting crying out of the voice of the dead trapper, Shelley; and the ominous warning coming over the clearly non-functioning radio set — work beautifully with the film's visuals to create a mood of unsettling loneliness, isolation, and soul-deep fear. 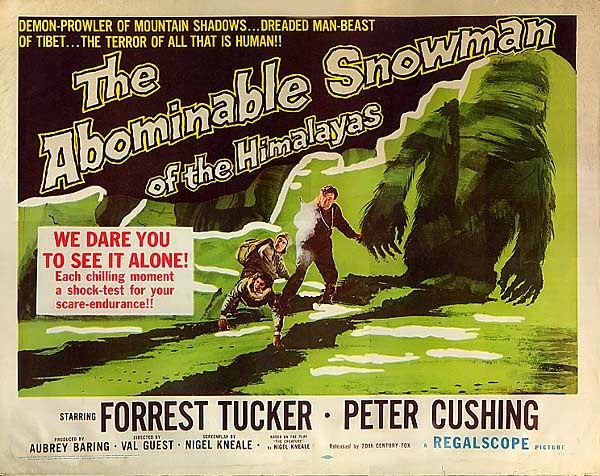 While undeniably slow-paced, with a sometimes long-winded script, The Abominable Snowman of the Himalayas presents a unique take on the Yeti legend and serves up some dark, foreboding atmosphere reminiscent of Universal's Creature From the Black Lagoon with Hammer's distinctly British bent. It's easy to understand why, as a child, I found the film boring; it doesn't conform to childish expectations. 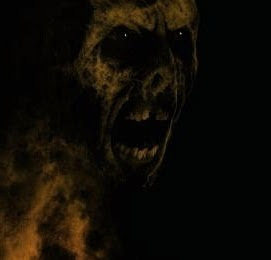 It seldom appears on broadcast television anymore, and though it was released on DVD by Anchor Bay over a decade ago, it is no longer readily available. I have an excellent VHS copy that I recorded from AMC back in the dark ages, when it broadcast movies uncut, without commercials, and featured hosts who provided commentaries before and after each film. I imagine I will have to settle for that version for the foreseeable future. If you get the chance to view The Abominable Snowman, I would strongly encourage you not to miss it. It's a perfect blend of anger, frustration, relief, and thankfulness. If you're anywhere in the southeast, you're probably feeling the brunt of the winter storm even now. It's been on the schedule for several days, and it moved into NC's Piedmont Triad about one o'clock this afternoon. It's not as if there weren't plenty of warning and adequate time to prepare and adjust schedules accordingly. 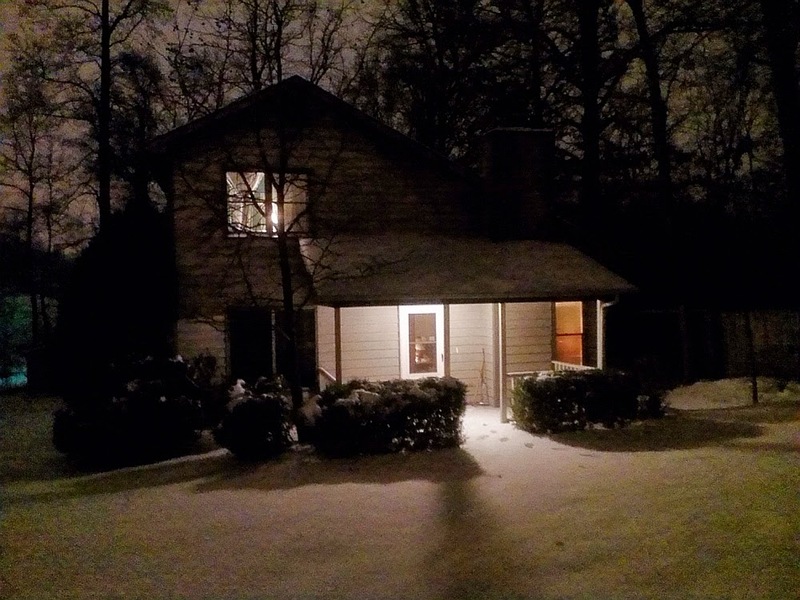 And after the recent debacle in Atlanta, and other southern areas that simply aren't accustomed to extreme winter weather, you'd think communities would have their proverbial houses in order. Yeah. Sure thing. Right after lunch, I saw it was getting rapidly white outside — a very slick white, based on the behavior of the motor vehicles in the parking lot. My gut told me, leave now because it's going to be a beast out there in a short while. Word came down that the office would close at 2:30 PM. Another hour or so. Now, at my workplace, if you don't feel safe in adverse weather conditions, there's no problem using personal time to leave. But I decided to be a good trooper and finish out the day. Well, no good deed goes unpunished. Apparently, every business in town had decided to release the horde at the same time. As soon as I hit the main road home, I found myself in a parking lot. No movement. Gridlock. Snow was gathering so fast while I sat in one spot that every time I did manage to inch forward, the tires spun. It's usually a 15-minute drive to and from work. I lucked out at 90, but not without mishap. I made it to within 400 feet of my house, to the intersection at the bottom of the hill where, during the last icy spell we had, just a couple of weeks ago, there was a rather scenic five-car pile-up. It had happened again. Another car had come down the hill, slid, and smashed into the trees across the intersection. An officer and a tow truck were on the scene, completely blocking the longer but safer route around to my house. The car in front of me opted to go up the hill. The very steep, very slippery hill. If the driver had just kept going, he would have made it. But he slid a bit and, apparently unnerved, decided to stop. Bad move. From a standstill, when he tried to get going again, his tires started spinning. Then the car began sliding backward — right toward me, waiting at the bottom of the hill. With the tow truck, police car, and several cars behind me, I had limited options. I threw it into reverse, pulled as far to the side of the road as I dared. Up the hill, the errant vehicle was still sliding toward me and gathering momentum. The driver at least had the presence of mind to turn the wheel so the car was coming down sideways. Knowing now a collision was inevitable, I turned as tight as I could, maneuvering so the passenger side was to him. My only thought at the time was at least this wasn't going to injure either of us. Boom. He hit me broadside, and suddenly my car was moving, the other car pushing mine over the icy road surface with virtually no resistance. Suddenly, I wasn't so sure about that whole non-injury thing. But then, a moment later, we came to rest a few feet from the edge of the crossroad, both cars still perfectly side by side. We got out, checked ourselves, checked our vehicles. Amazingly, my old Buick took only a few superficial bruises. Not even worth hammering out. The other car fared a little worse, but not by much. The officer at the other accident came over to make sure we were all right, but she was still occupied and couldn't offer much assistance. Thankfully, we didn't need any, but at least we did have an official eyewitness. The other driver and I basically agreed that we were fortunate and opted to leave it at that. Both old cars, both boasting a few more scars that add character. Just another ding on the Great White Beast. Lord bless that sturdy old Buick. But from now on, when the weather turns bad, I'm going with my gut, and that shall be that. Right now, there are many, many who are going through worse storm-related trials. Be safe as safe can be out there, folks. 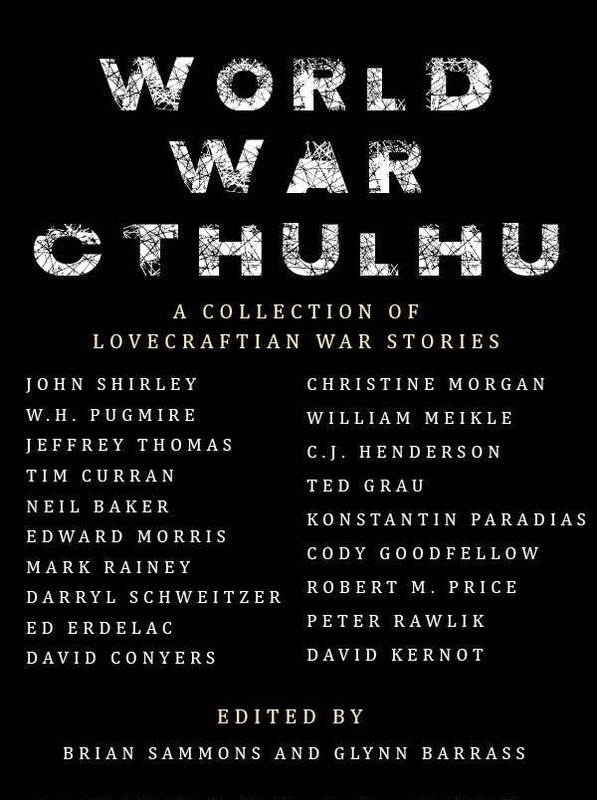 World War Cthulhu: A Collection of Lovecraftian War Stories will be available for pre-order from Dark Regions books beginning February 25. The illo at left is not the cover but a promo piece by the right honorable M. Wayne Miller, who has provided numerous works for Dark Regions as well as for my own novels and collections. 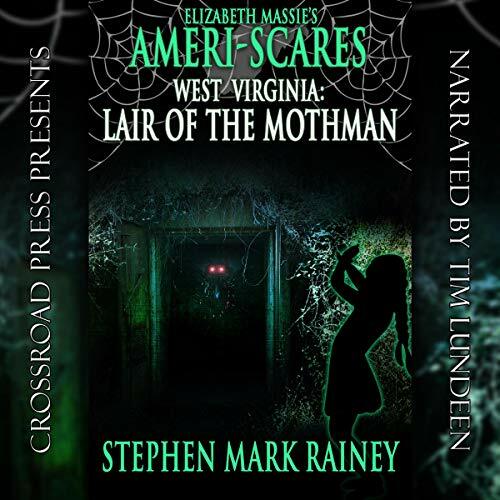 The book is set to be released in e-book, trade paperback, and hardback editions, with several pricing levels to offer buyers a host of different perks — including being "tuckerized" (featured as a character in an author's upcoming work) and even becoming ill-fated protagonists in specially written stories by one or more authors from the volume. More details on this when they are available. My story, "The Game Changers," is set in the jungles of Vietnam, right after the Tet Offensive, but the tales herein cover warfare from virtually every period of history — from the legend of Achilles and Agamemnon to the Crusades to the Revolutionary War to World War II to present-day Afghanistan. Contributors include Neil Baker, David Conyers, Tim Curran, Ed Erdelac, Cody Goodfellow, Ted Grau, C. J. Henderson, David Kernot, William Meikle, Christine Morgan, Edward Morris, Konstantin Paradias, Robert M. Price, W. H. Pugmire, Peter Rawlik, John Shirley, Darryl Schweitzer, and Jeffrey Thomas. Norman Dillon — known to the geocaching community as one half of "Spring1" — of Danville, VA, passed away on Friday, February 7, after a long and courageous battle with cancer. He and his wife, Lynn, have been avid cachers for many years and have cached in all 50 states, as well as in Canada and Europe. They have been fixtures at virtually every geocaching event in the piedmont areas of Virginia and North Carolina, and I can't count how many times I have run into them, just by happenstance, out in the field. Since they were retired, Norman and Lynn were known for being the first to find newly published caches anywhere in the area — and claiming "doing the FTF dance!" in their online logs. A few years back, I was in Danville when a new cache was published, and, being only a few miles away from it, I rushed over to it, hoping to snag the FTF. When I arrived, much to my surprise, there was Spring1's signature. I had missed them by less than five minutes, and, as it turned out, they hadn't even been in Danville when the cache was published; they had been returning from visiting their daughter, Robin, in Richmond, and the new cache just happened to be on their way. From talking to other cachers, I learned that this kind of thing happened with alarming frequency. To beat Spring1, you really had to be in the right place at the right time. But what a kind, amiable, selfless couple they proved to be. If you were having trouble finding a cache they had already found or that belonged to them, and you called them for a hint, if you were anywhere close by, they'd just get in their car and come over to help you hunt. When this happened, more often than not, we would spend a couple of minutes sorting out the hide and then another thirty minutes socializing. There was a spell between 2009 and 2012 that I could be virtually anywhere looking for a cache and the chances of running into Norman and Lynn were greater than not running into Norman and Lynn. It was hardly an infrequent thing to be somewhere in another town or state, finding a cache, unrolling the log sheet, and discovering Spring1's signature. Many, many other geocachers in this region could tell such stories about Spring1. Norman and Lynn have left an indelible mark in the caching community, and beyond, of course. I am so glad that I took the opportunity to visit with them the past couple of months; time can be shorter than one ever realizes. I must again thank Audra "Homestyle" Webb for getting a bunch of cachers together just before Christmas to go caroling at Spring1's place, shortly after we learned Norman was laid up for what would prove to be the last time ("Here We Come A-Caching"). He did reveal then that he wouldn't be getting any better. Norman Dillon is among those folks that I have felt most honored to call a friend. Godspeed, and happy caching in new and distant realms, Mr. Spring1. 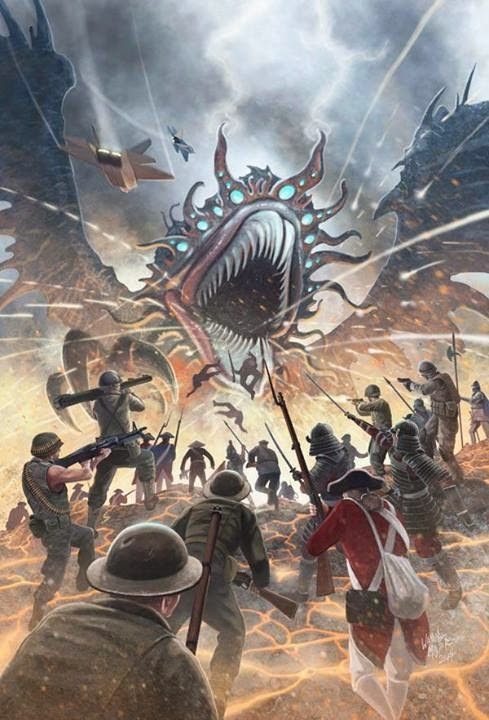 Wow — right on the heels of The Mountains of Madness, Dark Regions Books announces the upcoming release of World War Cthulhu, a new anthology of "Lovecraftian war stories," edited by Brian Sammons and Glynn Owen Barrass, that features my story, "The Game Changers." It's due in the next few months and is tentatively set to appear in trade paperback, hardback, and e-book versions. My story is set in the jungles of Vietnam, right after the Tet Offensive, but the stories herein cover warfare from virtually every period of history — from the legend of Achilles and Agamemnon to the Crusades to the Revolutionary War to World War II to present-day Afghanistan. Contributors include Neil Baker, David Conyers, Tim Curran, Ed Erdelac, Cody Goodfellow, Ted Grau, C. J. Henderson, David Kernot, William Meikle, Christine Morgan, Edward Morris, Konstantin Paradias, Robert M. Price, W. H. Pugmire, Peter Rawlik, John Shirley, Darryl Schweitzer, and Jeffrey Thomas. It goes without saying that I will post updates about this one whenever they're available. Might as well go ahead and get ready to duck and cover. It's been a long, strange road for this volume of blood-chilling tales to see the light of day. A few years back, director Guillermo del Toro was all set to make a big-screen adaptation of H. P. Lovecraft's acclaimed short novel, At the Mountains of Madness. To coincide with the film's release, writer, editor, and high priest of the Cthulhu Mythos, Dr. Robert M. Price, compiled an anthology of stories — including one of mine, titled "The Danforth Project" — that took the theme of Lovecraft's story of horror in the Antarctic and ran with it. At the last minute, however, del Toro's project fell through, and the anthology went into limbo. After several fits and starts with various publishers, Dark Quest Books picked up the project, and now... finally... it's here. Well, my contributor copies have not yet arrived, but several other authors whose works are included in the book have verified the book is, in fact, a reality. Other contributors include Ken Asamatsu; Glynn Owen Barrass; Pierre Comtois; Laurence J. Cornford; Cody Goodfellow; C. J. Henderson; Edward Morris; Will Murray; Joseph S. Pulver, Sr.; Pete Rawlik; and Brian Sammons. Fine company indeed for paying tribute to one of Lovecraft's best stories and one of my favorite works of dark literature. Publisher's description: "The frozen continent of Antarctica still harbors mysteries, slowly being revealed by intrepid scientists and by melting ice caps. The stories in this new collection offer more revelations still, as our frostbitten authors chip away at the legacy bequeathed by H. P. Lovecraft in his historic novella, At the Mountains of Madness. Lovecraft's epic is itself a continent teeming with lurking fears and horrors unknown. What mysterious entities did his star-headed crinoids serve? What genetic secrets gestated within the shifting masses of the unholy shoggoths? Can a mere human fathom or describe the thought patterns of such creatures? If the Elder Things survived, what further nefarious mischief might they have spread? Had there been other, earlier or later expeditions to the Lovecraftian tundra? Did the cyclopean metropolis of the Old Ones exist in this or some other dimension? Could there be unsuspected links between the Miskatonic Expedition and characters or events in other Lovecraft tales? What if The Twilight Zone had adapted At the Mountains of Madness for television?" 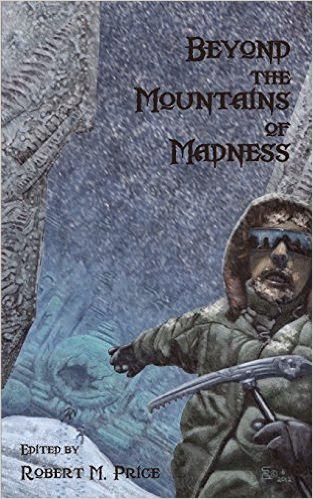 The Mountains of Madness is now available as a trade paperback, available from Dark Quest Books for $14.95. The closest I came to the Super Bowl yesterday was hearing the pre-game show running in the background while I sat at the bar at Fitzgerald's Irish Pub in Chapel Hill during a brief break from a day (and night) of fairly intense geocaching. I can tell caching is keeping me young because I put in enough miles on foot to be an achy old dude today. As far as the game goes, I'm led to understand that a flock of birds trounced a herd of horses, and I don't know what-all, but as for me, I was all caught up in a highly educational experience. 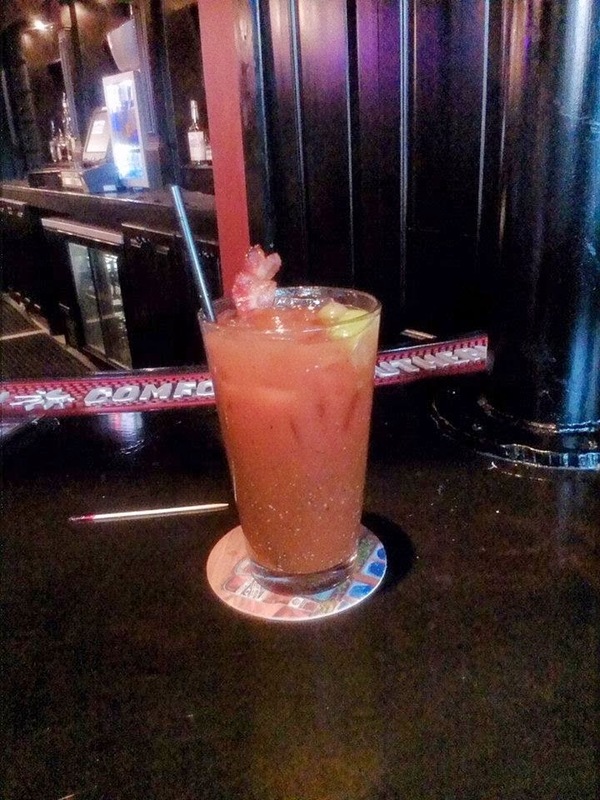 I learned that when you order a Bloody Mary (which, on Sundays, are $3.00 at Fitzgerald's) and the bartender asks if you'd like it with bacon, you say, "YES!" Or even "HELL YES!" if the mood overtakes you. For me, it did.